April is a month full of celebrations including National Poetry Month. It’s also the Month of the Young Child, when we focus on the benefits of early childhood programs and services. 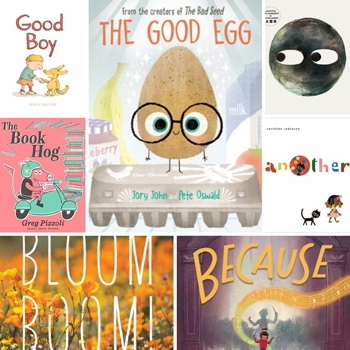 In honor of this annual celebration, we’ve selected seven picture books that are perfect for reading aloud to the young children in your life — over and over again. Embark on an exciting journey into a beautifully illustrated imaginative world in this wordless picture book. Discover the magic and the science behind spring flower blooms with vibrant photographs in this companion to the celebrated Raindrops Roll, Best in Snow, and Full of Fall. The Book Hog loves everything about books, but he has only one problem – he can’t read yet! When a kind librarian invites him to join for storytime, this literature-loving pig discovers the treasure that books really are. New York Times best-selling duo Mac Barnett and Jon Klassen deliver the final wry and resonant tale about Triangle, Square, and Circle in the last chapter of the clever shapes trilogy. From the bestselling creators of The Bad Seed, this is a timely story about not having to be Grade A perfect and learning the importance of caring for oneself and others. Previous Post: Love Libraries? These Books Are For You!